I’m going to recommend this." The inspiration for this novel came from one of my favourite children's book, Erich Kästner's Das doppelte Lottchen, which Hollywood adapted as The Parent Trap. My favourite film version is the German black and white film from 1950, with Kästner himself as the narrator, and Jutta and Isa Günther as the twin sisters who meet quite unexpectedly in summer camp. On a golden day in early summer, two young boys meet in the crowded streets of Florence and change the lives of a man and a woman forevermore. Seventeen years ago Georgina fled from England and all she ever held dear. But for the sake of her child, she must return to confront the man whom she once loved more than life itself until lies and deceit tore her life and marriage apart. Will their love stand a second chance? "The next time I see someone bewail, 'they don’t write historical romance like they used to,' I’m going to recommend this. The intense, angsty, sometimes uncomfortable story is very reminiscent of older books such as those by Brenda Joyce or Kat Martin, though terser and less epic. 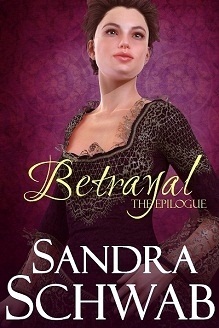 [...] The appeal of this sort of book is in the passion and intensity, and Betrayal is all about that. Rage, bitterness, vengefulness — tempered by unwilling love and concern." 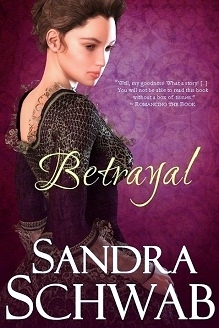 "This would be my third novel I've read by Sandra Schwab and yet again she has dazzled me. She keeps getting better and better." "Well, my goodness! What a story! [...] You will not be able to read this book without a box of tissues." "I cried a thousand tears, changed my pillow, continued reading, and cried some more." "[R]omance readers will love the story of lovers torn apart, nobility in distrss, misunderstandings, love turned hate, evil in-laws, and steamy love... This novel is quite a feat for an author writing in a language other than her native." Tuscany – where the summers are dry and hot and taste of herbs and olives and the heavy sweetness of dark wine; where the most famous artists of Europe have left their traces in old palaces and in churches striped like zebras. In the midst of the Val d’Arno, amidst rich green fields and hills clothed with the silver olive and vine, lies Florence, the City of Lilies, where once the powerful Medicis ruled. Lavish palaces stud the city and the surrounding countryside, almost as if the soil itself had produced them, and above the sea of red roofs the dome of Santa Maria del Fiore rides like a giant bubble, marking the spiritual center of the city. The sunlight gleams on its golden cross, and where the tower of the Palazzo Vecchio throws its long shadow across the Piazza della Signoria, the sun bathes the giant Neptune, dominating one corner of the square, in radiance. Green sparkles dance over the bronze nymphs at Neptune’s feet, yet untempted and unperturbed, he gazes into the distance. Nothing can disturb his majestic equanimity. Least of all the fates of mere mortals milling about in this place of worldly power. Thus he watched on with stoic calm as, by chance, two young boys met on the piazza on a golden day in early summer. Both had come to admire the splendid sculptures lining the square and hovering under the roof of the Loggia della Signoria – the graceful lines of Michelangelo’s David, Bandinelli’s Hercules as he kills Cacus, Cellini’s Perseus holding up the grizzly, blood-dripping head of Medusa for all to see, and many more. But from one moment to the next, the aging marble was all forgotten. Now the boys stood stupefied while around them the teaming life of the city went on. All they could do was to stare at each other in helpless perplexion, their flesh now as chilled as that of the statues around them. Two young boys with wavy dark hair and blue-grey eyes, their nostrils flared like those of nervous stallions. Two young boys on the verge of manhood, all lanky limbs and filled with a sharp hunger for life. ... and yet they were as alike as two round olives, ready to fall to earth. Eventually they went to find a tavern where they shared a carafe of wine and a loaf of garlic bread. Warily, curiously, they eyed each other over the rims of their glasses. “Finnian Crawley,” one of them finally said. He was the leaner of the two, his clothes less elaborate and mended in places where it didn’t show. Again, they stared at each other, speechless, chilled, while a suspicion formed in their heads. They didn’t yet dare to voice it, but from then on, they met daily, talking about their homes and families. Together they hatched a plan as daring and reckless as only the very young can conceive. They filled notebooks with page after page of hastily scribbled words, with maps and sketches, and thus familiarized themselves with the life of the other – until the day one of them had to depart from Florence. They said their goodbyes the night before and clasped hands while their hearts were beating with mad exitement and exhilaration, for they knew that before them lay the greatest adventure of their existence. – and changed the lives of a man and a woman forevermore.